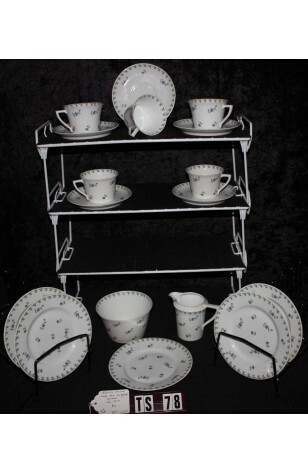 Vintage - English Fine Bone China Tea Set, having 17-Pieces, Service for (5) Five. A Beautiful Small Blue Flowered Pattern, Made in the 1950's. Lovely Everyday China Tea Set having a Service for (5) Five, in a wonderful Small Blue Flower Pattern with Green Leaves, on a Background of Bright White. A Nice Tea Set that maybe a Young Child would love to have for her Tea Parties. This is English Fine Bone China, but a little Heavier than most, and seems to be more durable. Great condition, with exception of two Cups having a really fine hairline age cracking. Lovely Everyday China Tea Set having a Service for (5) Five, in a wonderful Small Blue Flower Pattern with Green Leaves, on a Background of Bright White. A Nice Tea Set that maybe a Young Child would love to have for her Tea Parties. This is English Fine Bone China, but a little Heavier than most, and seems to be more durable. In Good Resale Condition, with exception of two Cups having a really fine hairline age cracking.